Focal has long been a force to be reckoned with in the pro audio industry, and has been making a serious push in headphones of late. Just recently, we looked at the Focal Elear headphones, which managed to achieve on of the few Headphone Review Gold Medals. Now, however, we’re looking at the company’s latest attempt at in-ear headphones — the Focal Spark in-ear headphones. The new headphones are relatively inexpensive, coming in at $70 — but can they keep the Focal quality we’e grown to love? We put them to the test to find out. The first thing you’ll notice about the headphones is their design, and they look quite nice. We’re reviewing the silver pair, which has a white cable, but the headphones also come in black. The design is very basic, but that’s not a bad thing. The in-ear unit itself is a basic silver cylinder, and on the end of each unit you’ll find the Focal logo, under which is a small grill. Part way down the left cable, you’ll find a small remote, which features a volume up and volume down button, as well as a central multi-use button. The build-quality of the headphones is quite nice, especially for a pair of headphones this inexpensive. The in-ear units are built from a nice and sleek metal, and while the plastic cable will likely be the fault point when the headphones do eventually break, the fact is that they should last a good amount of time before that ever happens. The cable is also flat, so it won’t tangle easily, which is nice. In the box, you’ll find the headphones themselves, a small hard-case, and a total of three pairs in eartips, including the ones that come pre-installed on the headphones. That’s all you’ll get, but you don’t really need much more — although it might have been nice to get some memory foam tips too. In general, Focal has done a great job at designing the headphones. They’re simple, to be sure, but that’s not a bad thing. The headphones don’t just look great — they’re pretty comfortable too. The in-ear units themselves are relatively small, which is helpful in ensuring that they stay comfortable for long periods of time. They’re also not too bad when it comes to staying in the ear, and the inclusion of different eartip sizes helps with that too. 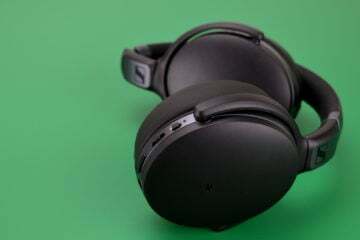 As mentioned, we would have liked to see some memory foam tips come with the headphones, which would have helped in keeping them in a little better and making them a little more comfortable. Having said that, they’re certainly not bad in the comfort department — and much better than the average pair of in-ear headphones. Now, design and comfort are important things to consider, but sound is arguably the most important consideration. Thankfully, the Focal Spark headphones actually sound quite nice — not that we didn’t expect them to. The bass on the Focal Spark headphones is relatively well-tuned and powerful, and it really shines through on pop songs like Katy Perry’s California Girls and hip-hop songs like Eminem’s Lose Yourself. It’s a little more natural-sounding than some other headphones though — and while we see that as a good thing for our tastes, mega-bass fans might be better suited looking for something even more bass heavy. In general, most will be happy with the level of bass on these headphones. The mid-range is very well-tuned. The low-mids are nice and round, giving the headphones a certain level of warmth you don’t always see on headphones like this. The high-mids are equally well-tuned, offering plenty there for vocals and guitars to cut through a mix. The high-end is nice-sounding, but perhaps our only complaint with these headphones is that they could be a little more boosted. Compared to the rest of the frequencies, the high-end feels ever-so-slightly cut, and while it’s certainly not a deal-breaker, it’s still something to consider. The Focal Spark headphones have a nice, wide sound-stage, and they don’t distort easily unless at unsafe volumes. Because of that, while the high-frequencies are slightly cut, the headphones sound great. Focal has done a great job at building an excellent pair of affordable in-ear headphones. They’re well-designed, reasonably comfortable, and they sound great. Sure, they’re not perfect — but nothing is. In fact, we would argue that these are the best in-ear headphones you could possibly get for this price. If you’re looking for a great pair of in-ear headphones under $100, we think these are the pair for you. They’re similar in quality to the Master & Dynamic ME01 headphones — and they look similar too. They are, however, much cheaper — making them a great buy. Because of their top-quality design and great sound, the Focal Spark in-ear headphones have been awarded the Headphone Review Silver Medal. You can buy them for yourself using the link below.